When a complex project requires high-performance tools to create, render, and analyze, many architecture, engineering, and construction professionals turn to Rhino. A CAD application AEC users can customize to their specific needs, Rhino models everything from curves to freeform surfaces. As such, the software also needs an equally powerful workstation to deliver peak productivity. Developed and released by Robert McNeel & Associates, Rhinoceros 3D is a computer-aided design platform used to model, render, analyze, animate, and document various surfaces, curves, point clouds, and solids. The notable application is popular with AEC professionals for a number of reasons. One distinct feature of Rhino is its non-uniform rational basis splines (NURBS) geometry, a system for translating mathematically precise shapes and objects into 3D models. NURBS can accurately represent anything from a 2D curve to complex designs like car bodies. Another appeal of Rhino for some users is that, as an open-source platform, AEC professionals can customize interfaces, commands, and menus. With a range of available plug-ins that either add to or expand on Rhino capabilities, users can further personalize the application for their specific field. Rhino offers AEC professionals a highly capable tool for modeling all sorts of objects, shapes, and geometric designs. With precise mathematics informing how curves, meshes, and points are produced, Rhino gives users a fast and highly detailed way to create realistic and richly defined models. AEC professionals can engineer, prototype, and analyze any model from aircraft and automobiles, to structures and industrial facilities. Because modeling is its primary function, Rhino is a frequency-bound application, a key factor to consider when determining your Rhino workstation requirements. Rhino performance isn't affected by the number of CPU cores in your workstation, but rather the frequency of the few cores from which the software draws power. 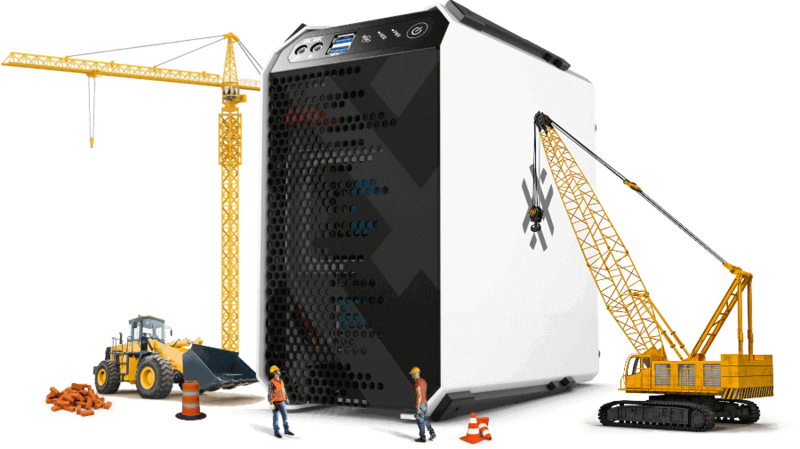 In order to accelerate your specific creative workflow, BOXX configures its Rhino workstations, like the highly recommended APEXX S3 professionally overclocked to 5.1 GHz to enhance frequency-bound applications. When its time to present models, AEC professionals need a way to render their designs and with Rhino, they have a number of options. For instance, users can take advantage of any one of the available rendering plug-ins, they can export files to a rendering application, or use Rhino Render within the software. Whatever route you choose, be sure that your Rhino workstation is configured to handle both primary modeling functions, as well as rendering workflows. AEC professionals are no stranger to having to work on-the-go, but no matter if you're in transit or remote, you need a capable mobile workstation to support Rhino creative workflows. Finding a computer to emulate desktop Rhino performance isn't easy, but it's not impossible. BOXX has developed a line of mobile laptops which provide users the same type of performance they'd expect from a desktop workstation. For instance, while the GoBOXX MXL features an 8th generation 3.7GHz Intel® Core® i7 processor, the GoBOXX SLM has six cores and the power of the new NVIDIA Quadro® P4000 GPU.